A LowePro Flipside 300 backpack will hold a KX3, AlexLoop, tripod for the loop, Tenergy 10AH LiFEPO4 battery, and misc accessories. This enough to operate at a picnic table or bench. The bag fills from the front which allows the tripod to be on the back. Internally, there is the AlexLoop and three bags; a ThinkTank bag for the KX3 and two Arriba Microphone bags. One Arriba bag has the battery and the other has the accessories. There is nothing wrong with the AlexLoop bag but, this packs it all into one. The KX3, AlexLoop and the 10 AH battery are a lot of capability for portable ops. Marv KK4DKT and I made another Orlando Hamcation trip. We arrived on Friday for a few hours at the hamfest. Friday night Marv visited his daughter who is going to school in Orlando. I did some ops from our third story room at red roof. I made a few contacts on 30 meters using the KX3 and the Alexloop. Any contact from indoors is a joy. Saturday we put in our due at the hamfest. The crowd was large. I met Kelly K4UPG and friends for lunch. See more on Kelly's Blog. My big buy was a Hexagonal Beam from Roger KA4RR. It was a pretty good deal. I don't have any type of beam. I see this as a field day antenna and eventually installed at the house. They are clever antennas but large. So this will be a new challenge supporting it in the field. It was a pleasure to attend the QRP forum in the afternoon setup by Jim K4AHO. The excellent presentation was by Jim W4QO on DX and QRP. The gist is that QRP makes ham radio more interesting and challenging. I was invited to give a demo of the KX3 and the Alexloop after the forum. The weather was perfect. 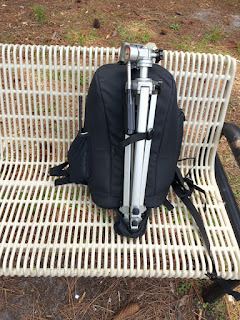 I am rather proud that I can pack the KX3 and the Alexloop into a backpack which also includes a tripod. The Alexloop gained the most attention. My claim is it is the most convenient portable antenna to setup. It is so small and self contained compared to a dipole or just about any wire antenna. So I chose 20 meters around 14.060. My first call was to N8ZYA. Darn! he did not hear me. The second call was to KO1U Mark. I got him and he even gave me a 599. 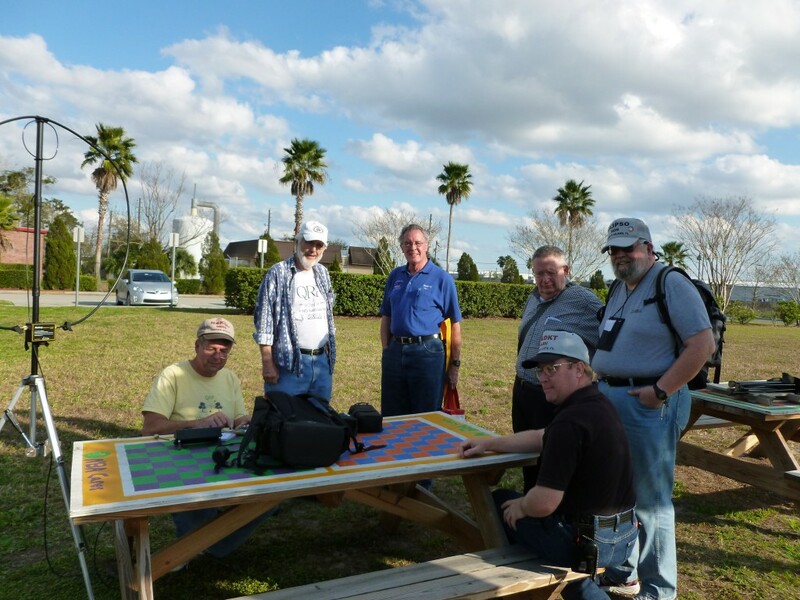 I always enjoy meeting QRP folks at the hamfests and Orlando came through. Thanks Jim and Kelly. Marv bought a slinky antenna. He tested it out in the hotel parking lot late in the afternoon and into the evening. Marv has his FT 897 and accessories in his Ham Box 1000. See the pictures. Marv snagged his first New Hampshire QSO. He had been trying for NH ever since he got his license. He was born there. We made it back safely Sunday and made a few 146.52 contacts on the way. So all good for another Hamcation. It was enjoyable. There was quite a contingent of Panama City folks here having fun. Roger NA4RR Hex Beams. Roger is very helpful to us hex beam neophytes. Alexloop and KX3 in backpack. Also includes tripod for the loop and 10 AH LiFe battery. 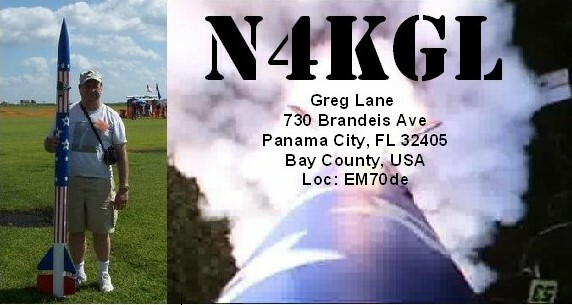 My QRZ.com N4KGL page has my Mighty Mo rocket photo above. It was the featured profile for a while on QRZ.com. John W8JER of Sturgis, Michigan saw the photo and just had to check our rockets. At the February 2nd Samson AL launch John drove up and parked. I am always encouraging folks to come to our rocket launches. However, we don't usually draw folks from Michigan. John and his wife Michelle made Samson a stop on their way to the Orlando Hamcation. So John and Michelle had plenty of rockets to watch. I launched my 4 inch diameter Thor with a patriotic paint scheme on a 54 mm J415 motor..
Of course, John and I talked Ham radio. He drives a Ham Radio equipped Subaru mobile. I offered or perhaps insisted on showing John my Elecraft KX3. So what to use for an antenna? The most convenient is the Alexloop. I setup the loop and we checked out 17 meters and it was active. There was a Michigan station on. John keeps a sked with his friend Jeff WD8PER from Sturgis. 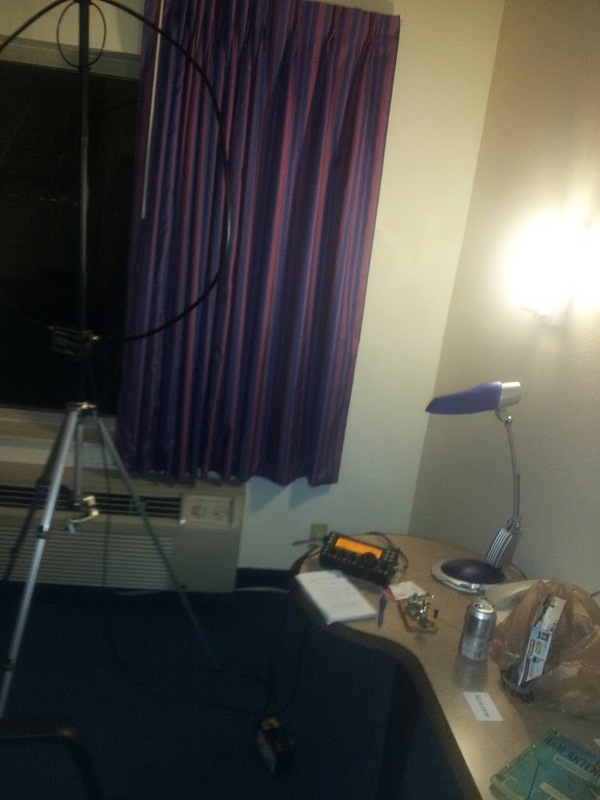 So John called up Jeff and he heard the 10 watt KX3 S9 in Michigan. John took the mic and had a chat with Jeff. John was impressed with the Alexloop. It is always fine business when you make a point to point QSO with a friend. It was nice to meet and make friends with John and Michelle. It was my two hobbies rockets and radios coming together. Look for John with his fuzzy hair cap at the Hamcation. He will have a table there to sell some gear. Perhaps he will buy an Alexloop sometime. Also check out W8JER's page on QRZ.com he has an awesome Hex Beam and tower.